I am using linear potentiometer to control the speed of a DC motor. I am using the following schematic. An ATmega328P receives the value from linear potentiometer via analog read. This ATmega328P transmits the value via CAN. Other ATmega328P receives it and analog writes the values via optocoupler (4N35) to the motor controller (Kelly's KDH14601E). The motor controller uses this value to control a 110V DC motor (lynch LEM 200 D135 RAGS). The High voltage and low voltage sides are completely isolated in the motor controller. Initially I was not using the optocoupler and the microcontrollers were hanging in no load condition also. 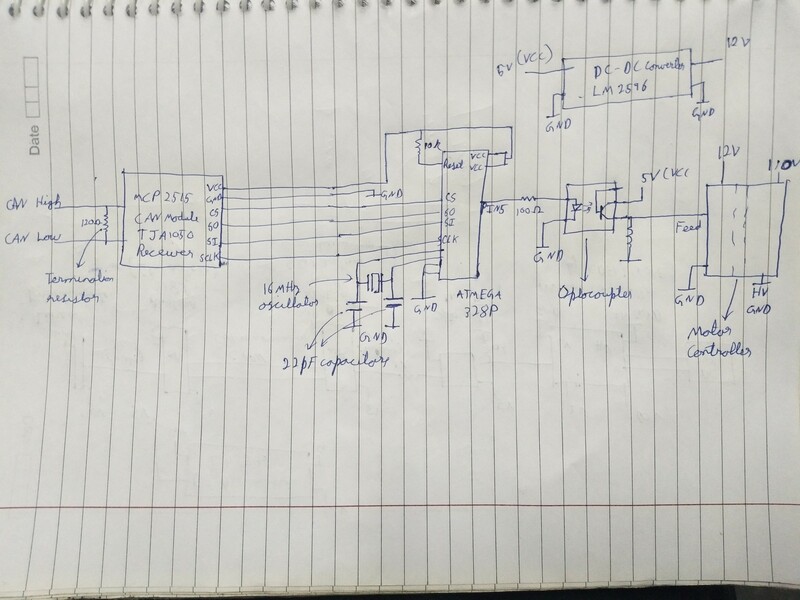 If I use a different LV (Low Voltage) supply for motor controller and optocoupler, everything works fine but I cannot do this in my final setup (I must use only 1 LV battery). In this case, both low voltage sources are completely isolated. If I use a different LV (Low Voltage) supply for motor controller and optocoupler and connect the ground of both Low Voltage batteries, everything works almost fine. Sometimes the microcontroller reads a value which is not practically possible, but there is no hanging of microcontrollers. I put a diode in the path which connects optocoupler output to motor controller, but observed no change. P.S. : The motor controller manual states that a potentiometer should be used to feed the controllers, but I cannot directly feed the value of linear potentiometer as I have to make certain modifications to the values. If your sketch is to be trusted, you haven't included a decoupling capacitor for the ATmega328P. That's most likely the cause of your problems - especially since you mention it working correctly if you power the ATmega328P and the motor driver from seperate power supplies. There are tons of questions and answers on this site about what decoupling capacitors are and how to use them. You probably need at least a 100nF capacitor from ground to each Vcc pin on the ATmega328P. Since you show two Vcc pins, you will need two capacitors. Place each capacitor as close as possible to the Vcc pin it serves. You may also need a single, larger capacitor on the board with the ATmega328P. Say, like, 1 to 10uF. Try that out, and read up on decoupling capacitors. You will encounter them often in pretty much all kinds of circuits. Not the answer you're looking for? Browse other questions tagged microcontroller power-supply motor opto-isolator motor-controller or ask your own question. 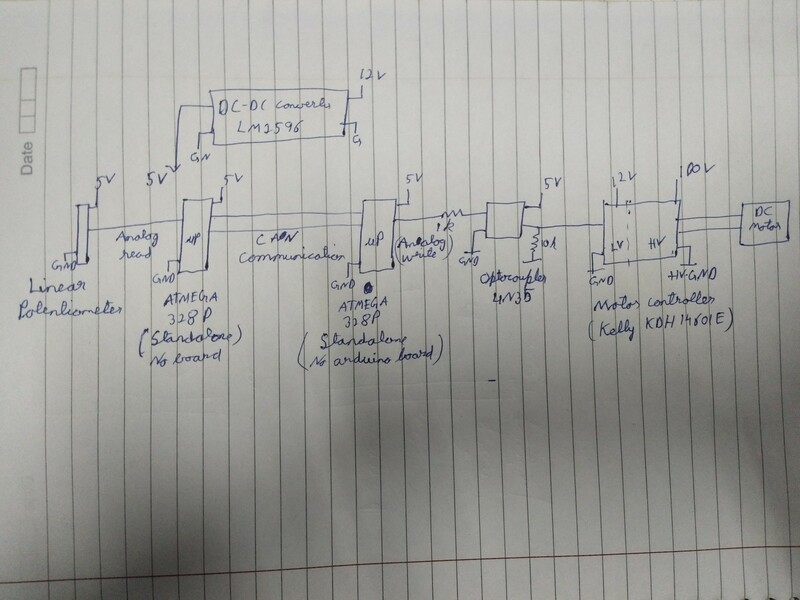 How to control switch mode power supply feedback voltage through optocoupler?